The win was made all the more sweet after Bruno’s bother Daniel Hasulyo, who helped set the early pace, crossed the line in 4th place, behind France’s Titouan Puyo, to claim the copper medal for Hungary and give both the team and family an historic podium double. 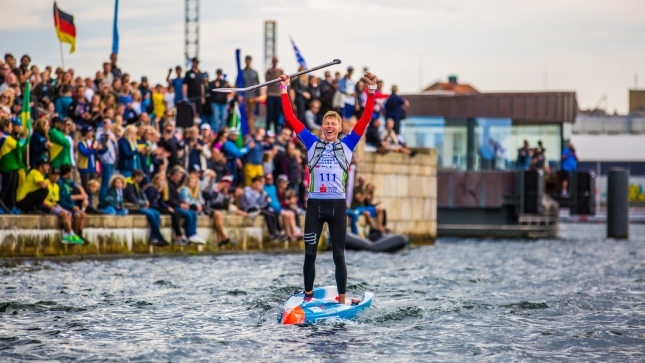 It was an intense start to the race as 70 guys – by far the largest field in an ISA event thanks to the 42 nations that have descended on Denmark – sprinted off the line towards the first buoy, where a bottleneck soon formed that caught up some of the big names. That included defending champ Michael Booth from Australia, who went for a swim around the opening turn and never recovered, with Boothy spending the entire afternoon fighting back through the field to only just sneak inside the top 10. But out front it was the Hasulyo brothers setting the pace, as first Daniel assumed the role of ‘train driver’ before Bruno took over in the second half of the race. The early tempo set by Daniel – who was only considered an outside chance at a top finish given his relatively light race schedule this season – destroyed the majority of the field, with big time gaps quickly emerging as competitors snaked their way around a scenic course that used Copenhagen’s iconic opera house as its core. Titou, who was the silver medalist in this event last year (as well as our gold medal prediction), was one of the the only guys who looked comfortable sitting with the brothers, with the Frenchman holding down second or third during the majority of the race and always looking like he was ready to make a move. The other two competitors to join the six-strong breakaway group were Mo Freitas and Arthur Arutkin. But as the field continued to whittle in the latter stages it was Connor who broke away, splitting the front pack and setting a tempo that only Bruno could hold. The world number one looked like he might be able to claim gold for Team Hawaii, which would have matched his victory in the ISA beach race two years ago, with Connor smartly sitting on Bruno’s tail for the entire final lap and clearly attempting to conserve energy for the finish. However it wasn’t to be, with Bruno simply too strong and paddling clear in a frantic final 250 metres after Connor lost his balance (and a couple of board lengths) at the final buoy turn. Bruno triumphantly crossed the line in front of the opera house to a massive cheer from the assembled crowd, with Connor about 10 seconds behind and Titou another 30 odd seconds further adrift. Titou looked good all day, however the Frenchman could never do enough to reel in the Starboard duo out front. The big story was with Daniel crossing the line next to claim the fourth-placed copper medal, which gave the Hasulyo brothers an incredible double podium finish. Bruno and Daniel are the only two representatives of Team Hungary, which is one of the minnows in the SUP racing world but now suddenly has two medals to its name. Hawaii earned valuable team points after Mo Freitas, who fought bravely all day and never gave up, crossed the line in fifth place. It was also a spirited performance from Arthur Arutkin, who crossed in sixth to give Team France – our favourites for the overall team title – valuable points on the leaderboard of nations. In another amazing result, there were just four nations in the top eight spots after Hungary, Hawaii, France and emerging power Italy all did the double. That Italian duo consisted of two highly under-rated paddlers in Martino Rogai and Paolo Marconi, who took down some big scalps today and did their nation proud with the double top 10 result. Highlighting how unique this ISA teams event really is, Paolo and Martino worked together after getting stuck in no man’s land to hold off the fast charge from reigning gold medalist Michael Booth, who was blazing through the field following his horror start but couldn’t manage any higher than a ninth-place finish. Another medal contender who had a rough day at the office was Trevor Tunnington, who managed a respectable top 10 finish but will be unhappy not to have finished higher after he too got caught up in the rough waters. Trev’s compatriot Marcus Hansen crossed just outside the top 10 for a solid personal result, before the rest of the field was full of sprint finishes as the mid-pack draft trains fought for what was left of the all important team points. It was also great to see the crowd sticking around and cheering on all the athletes from the smaller nations. 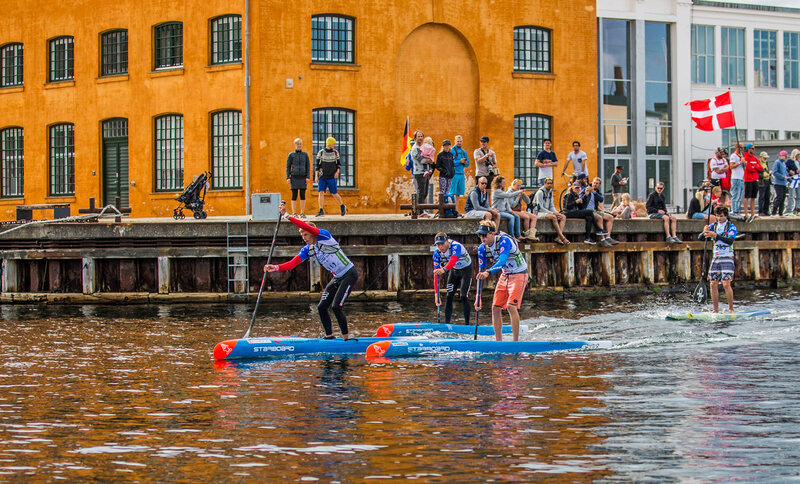 That’s what this event is really all about — seeing the spread of stand up paddling to so many new frontiers. 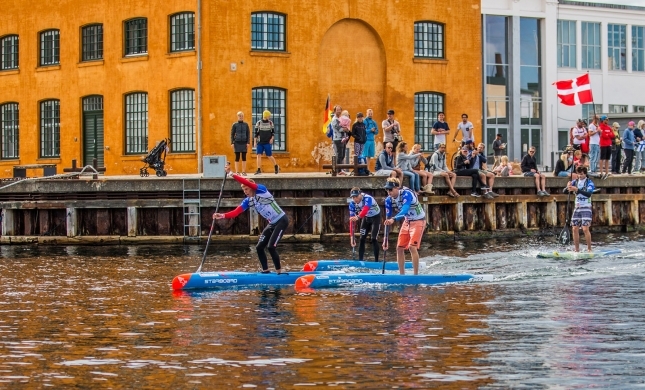 There are 13 teams debuting here in Denmark, including far flung paddling nations such as Russia and Hong Kong. However the biggest cheer of all was reserved for young Christian Andersen, who did the home nation proud with a spirited top 20 finish against men twice his age (and size). In the traditional prone paddleboarding division, Lachie Landsdown matched Jordie Mercer’s heroics to make it a clean sweep for the Aussies. The men’s prone race saw a mirror finish to that of the women’s, with the Aussies and their Trans-Tasman rivals the New Zealanders sprinting to the line in a frantic finish. With reigning gold medalist Sam Shergold bringing it home for the Kiwis, Lachie had to dig deep in order to hold onto the lead during an intense final hundred metres: the youngster left nothing in the tank and was unable to even speak for sending be several minutes after crossing the line. Anyway here’s the provisional top 10 from the SUP race; full results will be posted as soon as they’re released later tonight. The 2017 Worlds (and the live webcast) continue on Sunday with the sprint races at around 9:30am local time, before the whole show heads over to the west coast for the surfing and beach race events. In the meantime, check out Boss Man’s Bold Predictions to see how close (and not so close) we got the call today, as well as who’s looking good for tomorrow’s sprints and the overall teams title.